As a young boy, I struggled with low self esteem as I discovered myself. People kept overlooking me and I couldn’t comfortably hang with my friends. Silently, I always hoped that one day I could create a positive impact in my community. Fast forward to February when a friend of mine talks to me about the U Decide project. I enrolled to become both a peer educator and peer service provider. I haven’t been the same since. U-Decide is a two year innovative intervention in Mbarara district (Bugamba and Rugando sub counties) by Reach A Hand Uganda (RAHU)andReproductive Health Uganda in partnership with Rutgers ensuring continued empowerment of young people with Sexual Reproductive Health information through a peer to peer led approach focusing on skilling young people as peer educators through an innovative training approach. As a peer educator attached to Bugamba H/C IV, I am fully aware of my potential as a young person, with full knowledge on the roles to play in transforming my area. I equip my peers with accurate Sexual Reproductive Health information and services including referring them to equipped health centers and am trusted. I have gained more exposure through working with different kinds of people and travelling beyond my homestead like when RAHU transported us to Kampala to attend their annual youth health camp where we met fellow young people from all over East Africa. In Bugamba we lack adequate and accurate reproductive health information. We have had some SRH campaigns but they all stop in urban centers and the young people in the villages miss out. There are very few centres providing youth friendly services, so the services themselves are inadequate. Besides, many of us live in hard to reach areas and therefore fail to get SRH services required when there is need. For example some young girls give birth from their homes by local birth attendants which may bring complications to them and the baby. Some of the youth are very shy to make decisions due to the fear that the nurse would tell parents about any SRH services I acquired. Asking for a condom or any family planning service in a shop is a nightmare. This is a common hindrance for many young people to access SRH services. 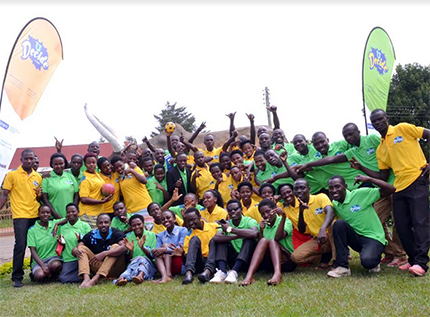 I believe RAHU, through using young people trained in their peer educator’s academy to reach out to their peers here is employing one of the best ways possible there is nothing for young people without young people. U Decide is also doing a great job by having young people at the forefront of the project both as implementers and beneficiaries. This to me is very meaningful involvement. However more community based peer educators can be empowered to be change ambassadors and to provide extensive accurate SRHR information and services. We need more health outreaches/camps in Mbarara to give comprehensive SRH services that are highly required by the people in rural areas who cannot access health centers. In just a month I saw 50 of my peers from deep down the village transformed into responsible young people with the purpose of empowering their peers communities. As peer educators, our self-esteem has been built to the brim and today we can request for any reproductive health service we (or our friends) require. So far (by September 2017) we have had over 5 community outreaches with free HIV/AIDs testing counseling and treatment, free family planning services and free cancer and STI screening services availing services for the people in hard to reach rural areas who can’t afford transport to health centers, or even paying for them in nearby private clinics. Next Story We’re seeking to partner with youth led organizations in Iganga, Mayuge and Butaleja!